Adam Nadel, AB’90, went from anthropology major to award-winning photojournalist. 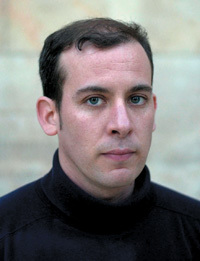 His first published photograph, Adam Nadel says, “was probably in the Maroon.” Since then his images have appeared in Newsweek, Time, Stern, and the Sunday Telegraph, and his photo essays have covered such diverse subjects as a boxers’ training camp in Thailand and “Three Weeks with the Palestinian People,” the first-place news picture story in the 2002 Pictures of the Year International competition. His latest international award came this year, as his “Sierra Leone amputee football team” (see pages 52–53) won World Press Photo’s first prize for sports feature singles. On September 17 “Three Years of Pictures,” his fourth solo show, opened at the Chester (Connecticut) Gallery.—M.R.Y. Upon graduation I was quickly struck by the realization that I was somewhat clueless about taking photographs. So I got jobs at very small newspapers and began to learn all kinds of things—like how to use a flash. After freelancing in New York for a few years AP hired me. When I began working I set a few goals for myself. One was to be staff at AP. It seemed a good idea at the time. Once I arrived at the intended destination it was another issue entirely. I wanted the freedom to shoot what I was drawn towards. Freelance was the only option. I’m not really sure how I’d define a good photograph, although Leo Hsu, AB’91, AM’92, and I have a lot of conversations about this subject. I think we might address the question by rephrasing it: “Where do particular photographs appear and why?” I’d do so to avoid the question of “good” because I guess I did not pay enough attention during my common-core classes and don’t know what “good” is. One makes aesthetic judgments every day, and I find it very difficult to provide a nonintuitive justification for assigning quality to an image. I spend a great deal of time looking at photography and have never felt “influenced,” but often a bit humiliated by, a great number of photographers. For the last few years I have been looking at a lot of landscapes. After the gallery opening in mid-September, I hope to travel to Sudan and Chad to continue a long-term project on civilians and modern warfare. I hope to complete that project in a year or two—it’s getting the better of me at this point! I’ve also been working on a number of land- and skyscape projects. There’s a project on circuses I’ve been shooting for years, but that won’t be done for another decade or so.